this video takes a second to get going, sorry! JD hanging in a tuk-tuk on Khao San Rd. In mid-1999 we found insanely cheap tickets to Thailand and decided to go hit the beach! We visited Bangkok, Chang-Mai, Ko Samui, Ko Pan Ngan and Ko Pi-Pi -- lots of Singha and beach and the best Panang Gai ever made on the planet ever. this was the 1st trip we made with friends in tow....it was a mixed bag (as any trip with a big group is) at times but we all still laugh about it and miss our weeks on the road! Karen and I decided to do something challenging and as off the beaten path as possible. We took 6 weeks went from Istanbul to Cairo (mostly overland). Highlights included pitching a tent on the roof of a sold out hotel in Syria, sleeping in the Jordanian desert and diving the Red Sea. Also, on this trip, we met some 'friends of friends' who put us up in Cairo. Jon-Lea and Bob became OUR friends too and would, years later, put us up in New Delhi when we visited India. 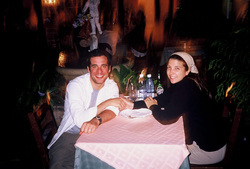 After our awesome trip to Thailand in 1999, we decided to see more of the area in a return trip in 2001. Obviously failing to learn our lesson, we brought along friends once again. Aside from the Larium side effects that pervaded the group, we had an awesome time. Highlights: Angkor Wat, Cat Ba Island in Vietnam and diving Ko Raya, a small island off of Phuket in Thailand (which, I believe, was decimated by the tsunami in 2004). Karen and JD visit some Moai. A glorified anniversary dive trip, this was one damn pricey getaway -- and worth every penny. The diving was exquisite (some of the best we'd ever done) and Easter Island lived up to the mysterious and desolate vibe that the tiny dot on the map conjures in the mind of travelers. With my brother, Joel, living in Brazil, we decided we'd go see as much of the continent as 6 weeks would allow. 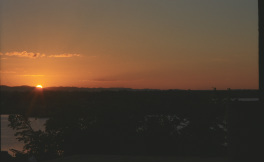 We started in Sao Paolo and made our way down to Argentina, up to Bolivia, Peru and eventually flew home out of Chile. Highlights included the incredible Iguazu Falls, tango in Buenas Aires, the tiny town of San Pedro de Atacama and hiking the Inca Trail. This time our friends joined us in Peru for the Inca Trail part of the adventure. It was the perfect mix of friend time and solo traveling. Our friends Jonlea and Bob had moved from Cairo to New Dehli since we first met them during our Middle East adventure in 2000. We decided to descend upon them and use their place as a base to explore India. Like most travelers we found India to be exhausting, amazing, oppressively hot, demoralizing and unforgettable. It was a wonderful but mixed bag of a trip. Highlights included the beaches of Goa, a river cruise in Varanasi and border closing ceremony at Waga. A quick but awesome dive trip with our dear friends Michael and Sara (if you're subjecting yourself to ALL our videos, you'll see plenty of Michael and Sara). We ended up on the Bay Island of Roatan. I thought the diving was a little overrated but the price was right (cheeeaaaap) and the flight was short and the beer was cold so, who am I to argue? 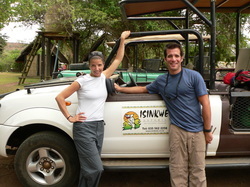 Karen and JD game drive in SA. Technically, we could say we'd been to Africa from our time in Egypt but both Karen and I wanted to dip our toes in the massive, diverse continent for real. We planned a 5 week trip starting in Cape Town and pretty much made the rest up as we went. We drove thousands on kilometers on this trip and made stops in Mozambique, Lesotho, Swaziland, Zambia, Zimbabwe and Botswana. Highlights (too many to list) Victoria Falls, game drives in Botswana and SA, diving, bungy jumping....all of it. 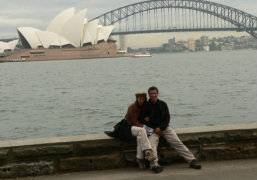 Karen and JD (and Scout) in Sydney. With our bags packed and by the door, Karen casually mentioned that she might need to stop at the pharmacy for a pregnancy test. And so it was that our Australia / NZ trip became a kind of "OMFG WE'RE GOING TO HAVE A BABY TRY NOT TO FREAK OUT" adventure. On the upside, my son got to bungy jump and shark snorkel before he was ever born. 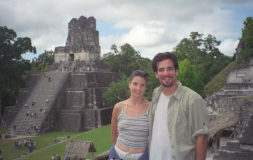 This was a great trip, sort of perfect for an expecting couple -- we spent much of the time dreaming about the day we'd bring our kid(s) back to see it all over again. 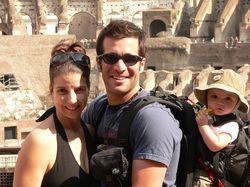 The family at in Rome. A break from the beach in San Pedro de Sula. 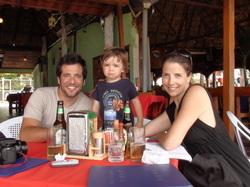 Our second international foray with the little guy, we planned to spend a good long while in El Salvador and then briefly visit Nicaragua, but in the end we fell in LOVE with the colonial Nicaraguan town of Granada and based most of our trip from there. Sand castles, beer and wandering the cobbled streets of Granada made for an amazing trip. Such was our fear of the Bush Administration that we didn't dare take a video camera with us to Cuba (not that we went to Cuba, I'm not confessing anything here, I'm just saying if I HAD gone, I would have flown to Cancun and paid cash for a ticket to Havana and spent an awesome two weeks touring and diving around the island). 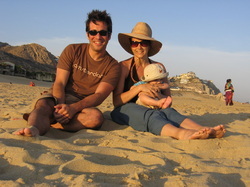 Our firs trip with our first child was a quick jaunt to the Baja Peninsula. Among the many things we learned: you can buy diapers and baby food anywhere -- don't pack much of either. Anytime tickets are cheap enough, Karen and I hop on down to Central America. We're big fans of Guatemala, Honduras, Costa Rica and we've spent New Year's on the beach in Belize. Our second child (a beautiful little girl) came into the world not all that long ago. So far we've only managed to drag her to Brazil to see her cousin. Without question, kids have slowed down the pace of travel but we want our kids to grow up "worldly" and have every intention of sending them off to college with a full passport and the ability to find the train station, a hostel and a beer in 10 different languages.